These prints are each single run lithographs printed in black from a lithographic plate. The exterior of the images was formed by the outer boundaries of a stone from a quarry near Page’s home in Ithaca, NY. The focus of the image areas were formed from dipping plant matter, harvested from Page’s gardens, in liquid tusche. The process was repeated, producing a layered effect reminiscent of sediment capturing objects for fossilization. Page’s interest in botanical ornamentation and stone construction materials has found a natural marriage in this work, creating an image that is both scientific in its approach and organically beautiful in its execution. 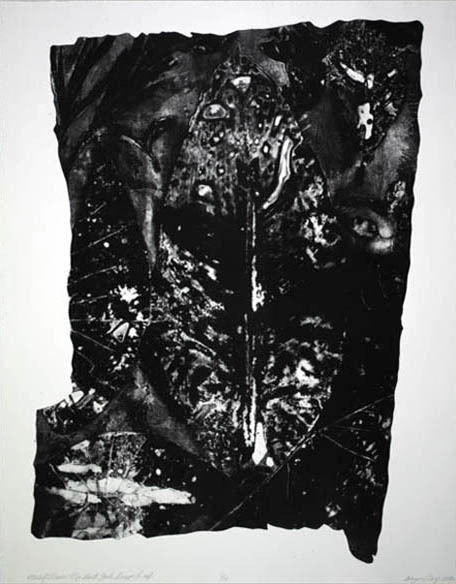 Gregory Page is an artist who has exhibited both nationally and internationally and is also an Associate Professor of Printmaking and Drawing at Cornell University. Page is enamored by the scale and ornamentation of architecture in ancient civilizations, specifically in Italy and the North-eastern Mediterranean basin. This admiration, mingled with his love of horticulture, has formed the basis of his current body of work, Motif from My Back Yard; the images in this series blend botanical forms with the rough-hewn edges of quarried stone.